Derbyshire-based security products manufacturer Securiscape has released a new version of its anti-terror barrier solution. The HVM Socketed Guardrail is a hostile vehicle mitigation pedestrian guardrail and has been successfully tested, having stood firm when it was deliberately rammed by a 2.5 tonne 4WD pick-up travelling at 30mph. The testing took place at MIRA last month and earned the guardrail its coveted IWA-14 rating. The product is a new version of the company’s existing HVM guardrail and uses a ground-mounted socket system in combination with Securiscape’s SmartPost in order to limit the excavation depth required to fix it securely into place to just 400mm. It does this by ensuring that the force from any impact is dissipated along the length of the railings, making the guardrail ideal for locations unsuitable for deeper excavations, such as bridges. The socket system also enables panels damaged by collisions to be easily and quickly removed and, although the HVM Socketed Guardrail is fitted with standard two-metre fence panels, it can be used in combination with more ornate railings befitting more historical landmarks. 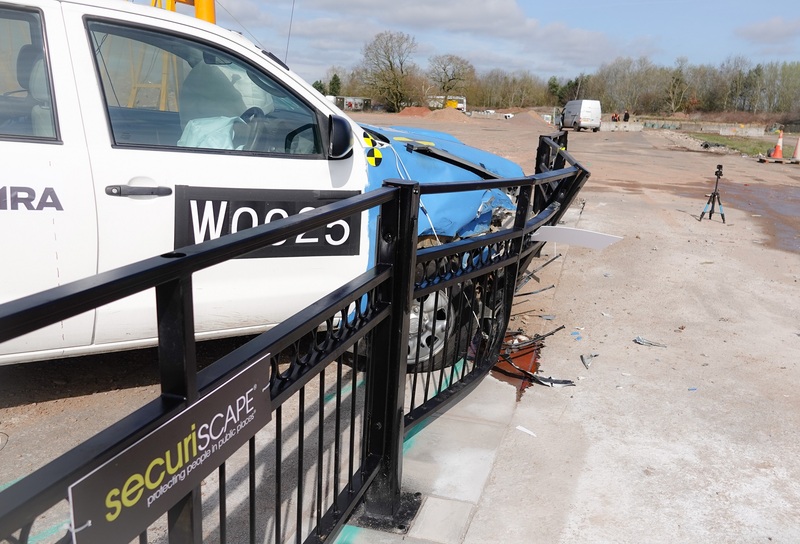 Mark Stone, managing director of Securiscape, said the guardrail was designed in partnership with a local authority that is planning to install it on one of its busiest bridges. Securiscape’s growing range of security devices also includes PAS 68-rated security planters, IWA 14-standard temporary barriers for public outdoor events, bollards and anti-ballistic litter bins. Mr Stone said: 'This test was the successful culmination of an extensive design and testing phase for our HVM Socketed Guardrail, which offers a more robust and more flexible solution than the standard pedestrian guardrail. 'Although it was developed in direct response to concerns around the safety of pedestrians using bridges in our towns and cities, the socket system means that it is suitable for other locations too. Securiscape has installed its products outside a host of premises across the UK, including King’s Cross Station, the luxury One Hyde Park residential development in London and Birmingham New Street Station.